Not only will you be the best but have the best on your feet in these Asics Gel Tactic 2 Gs Netball Trainers in an Aluminium, Dark Grey and Energy colourway. 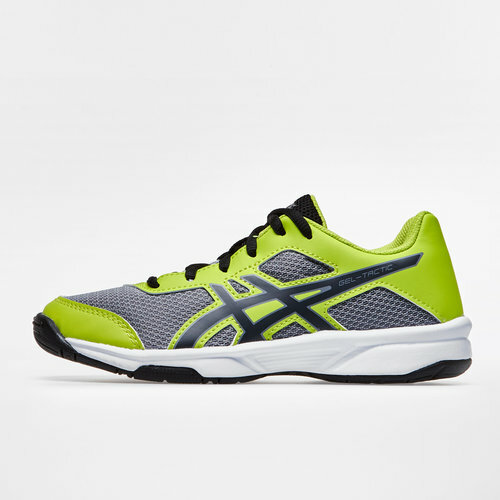 These netball trainers from Japanese multinational corporation Asics have been designed to offer maximum cushioning meaning high jumps are followed by soft landings. The Gel Tactic GS netball trainers use double gel in the rear and fore foot for soft landings whilst the open mesh upper allows for breathability and ventilation. Sweat and moisture is efficiently wicked away to leave feet feeling cool, dry and comfortbale. The EVA sockliner in these trainers is moulded to the shape of the foot whilst the outsole of the shoe uses a compound containing more natural rubber content, resulting in enhanced traction on court systems. The trusstic system reduces the weight of the sole unit while retaining the structural integrity of the shoes.